Hasbro released Willie Scott in 2008 as part of wave 4 in their Indiana Jones 1:18 scale (3.75 inch) figure line. 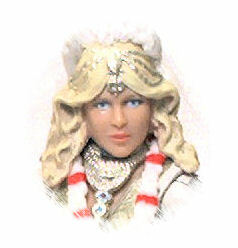 The figure is based on the gown worn by actress Kate Capshaw in the film Indiana Jones and the Temple of Doom shortly after arriving at Pankot Palace. The basic costume is based on traditional Indian women’s wear, consisting in a short blouse with elbow length sleeves and a long skirt worn over a pair of trousers. Willie’s clothing is richly detailed, with fabric textures sculpted on the blouse and minute pleating on the skirt. The gown is detailed with sculpted embroidery at the sleeves, waist, collar and a low-slung simulated fabric belt over her hips. Each of these sections has tiny sculpted filigree textures that remain visible even under the coat of light gold paint applied to them. To complete the attire, Willie wears a fastidiously detailed golden necklace and a real fabric veil. The veil is made from a shiny, sheer material and kept in place by an ivory colored rubber coronet glued to the top of her head. Willie also wears a white and red lei around her neck, although this is put on her later in the movie, when Mola Ram and his followers are readying her for sacrifice to Kali. An ongoing thing with most figures from the last wave in the Indiana Jones line is that the sculpting reached it’s peak just in time before the line was cancelled, and Willie Scott certainly falls in this category. Her hair sculpt captures the flow and shape of the hairstyle she wore in the movie, and the face is a really close likeness to Ms. Capshaw, aided by a stellar paintjob on eyes and lips. Ball jointed neck. Not much movement at all, between the hair sculpt and the two rubber necklaces she wears. Peg & hinge shoulders. The joint work very well on both sides. Peg & hinge elbows. Mediocre, the best they can bend is 45° but rotation is 180°. Swivel waist. Free 360° swivel. Swivel hips. These are practically rendered useless by the rubber skirt, but the joints do exist. So, no wrist joints and, typical for the design, no articulation from the hips down. The pant legs are fully sculpted beneath the skirt, which I guess would facilitate producing a version of the character as she appeared later in the movie, while running through the mine tunnels, but I think I’ll leave her be as it is for now. Willie doesn’t come with many accessories, unless you count the necklaces she wears as such, and even so, all she has that can be used (as opposed to be worn) is a small dagger that looks very similar to the one packed with the Short Round figure, and the obligatory Hidden Relic cardboard crate. Inside the crate there is a plastic prism meant to be the fabled Philosopher’s Stone and a sticker for the Passport to Adventure Mail-Away promotion. The gem is a blue-tinted, translucent plastic polyhedron made in a scale that renders it unusable with the action figures, but as a prop, some uses can be found for it. Willie Scott is a pretty good figure, despite the design limitations. I concede she’s nowhere near as exciting to play with as the similarly handicapped Mola Ram, but nonetheless, she still would have won a place in my collection thanks to the superb detailing and overall execution. I love this figure, but really wish we could have got her club Obi-wan look as well as when she was wearing indy’s tux through most of the movie. Yes, as a rule of thumb, they should always start making an action oriented costume for the first incarnation of a character in the toy line.